Managing the carbon footprint (or energy usage) of a facility that houses unwell patients 24/7 is in itself a daunting task. That is until you begin to break down all the areas of energy consumption into a few categories each having their own inefficiencies. Lighting, HVAC (heating and air conditioning systems), Conservation (both climate and water) and Waste Disposal comprise the main categories upon which we have focused. All this while dealing with a physical plant that was constructed decades ago without the focus on being green. So what have we done? First in the HVAC area, we have replaced furnaces and A/C units with models that push the efficiency standard. Although some areas of the hospital have been expanded and rely on less efficient systems we limit the use of these as much as possible. All areas of the hospital have chronograph based thermostats. Although these can be overidden any such change will revert to the programmed setting after a brief time. This allows us to restrict the need for heating and air conditioning to a specific time and location of the hospital during the utilization period. For example, heating and air conditioning only turn on in the surgical area during the times and days that surgery is scheduled. Likewise the front office is only climate controlled during specific appointment times and days. The isolation ward HVAC is off at all times unless we admit a patient with suspected contagion. This small area can then be heated to a higher temperature than the rest of the patient areas if necessary for a severely ill pet. Climate conservation involves reducing the heat (or cooling) loss through doors, windows, walls and roofs. In a building that has been frequently renovated during its fifty six year existence this is one of the harder tasks. Although there was minimal insulation in the walls at construction, fortunately it is a cinder block building which uses the porosity of the block as well as the air spaces in each block for heat and sound insulation. Although not ideal it does make for a building ahead of its time when it comes to wall insulation. As far as the ceilings are concerned all the original ceilings in the hospital have been enhanced by a suspended ceiling system using tiles which insulate sound, retain heat and allow for a several inch air space above, which further reduces heat loss. The outside roof, originally tar and gravel has been replaced by a rubber membrane roof, an extremely efficient albeit expensive replacement. All doors and windows have either been replaced with energy efficient ones or enhanced with the use of additional storm windows. In the area of lighting all fixtures have been replaced with either high efficiency, low wattage flourescent or LED. Brockton Animal Hospital is one of the only businesses in Brockton that has replaced all outdoor flood lighting with LED sources. Although more expensive upon initial purchase, LED lighting burns out far less frequently and uses much less energy than either incandescent or flourescent. Although only outdoor lighting is controlled by timers, staff has all been educated as to the importance of using lighting only when present in the particular area of the hospital. Finally, in addition to the above conservation, recycling of paper products, using all recycled paper for our needs, donating unused, but unexpired supplies to shelters in and outside of the US and encouraging the staff to drive fuel efficient vehicles rounds out the program at Brockton Animal Hospital. Even renting larger trash receptacles so we can reduce the frequency of pickups and thus the fuel by the recycling company figures in to our plan. 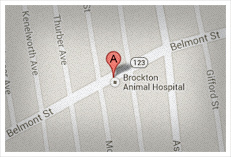 Brockton Animal Hospital is proud of the steps we have taken to preserve the environment. We are constantly looking for additional ways to reduce our impact on the planet. We encourage our clients to do the same. Together we can make a big difference in the wellness of our pets as well as the environment.